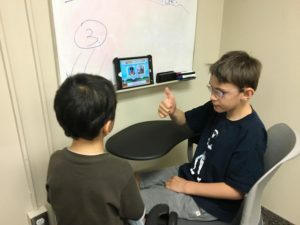 In partnership with the Geneva Centre for Autism and EmotePlay Inc., we have been developing a music-based program to support the development of social communication in teens/preteens living with autism. This program was developed with the objective of supporting socio-emotional development in a fun and engaging context. This program features choir singing, rhythmic games, acting, and exercises designed to provide practice with imitation of vocal, facial, and gestural expression. 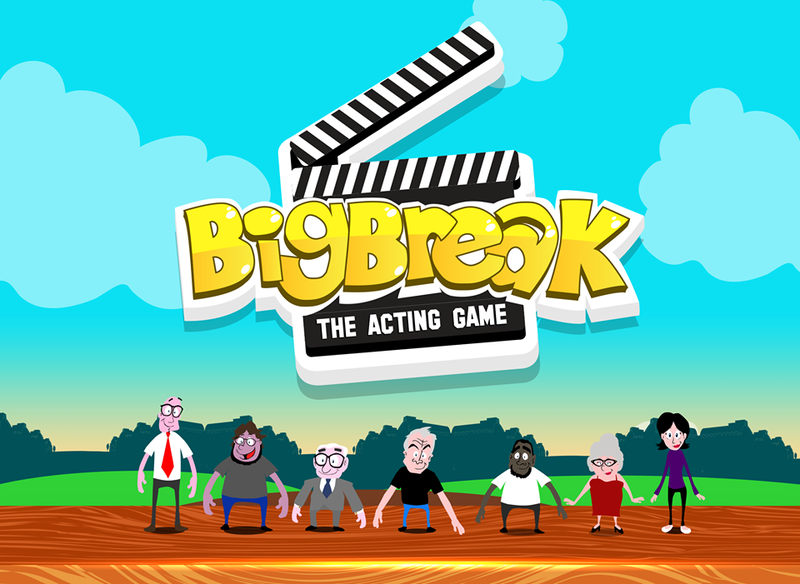 These exercises are further supported with technology assisted feedback provided through the use of the Big Break: The Acting Game. Our first run of the program happened in July, 2017 with sponsorship from the Telus Greater Toronto Area Community Board. The Big Break! 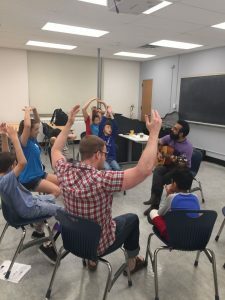 Singing & Drama Summer Camp is an exciting new camp where participants go through a curriculum based program led by professionals in musical education and autism. The one week camp involves a fun-filled morning involving interactive drama and musical games with a focus on increasing participants’ confidence in their ability to perceive and produce emotions in an expressive manner. Here is a photo of some campers singing some songs in the morning session with the musical director Sina Fallah, and Geneva staff Julia Silvaggi and Heather Laidman. Afternoons are spent utilizing the Big Break: The Acting Game to practice and further develop these skills and to reinforce concepts introduced in the morning session. Here, we see two campers co-operating together to get high scores on the game! Parents were invited to view the final musical performance from the campers. They performed three full songs together, as well as presented their favourite Big Break app movies they made. The Big Break App is a spin-off of a web-based game that our lab recently developed for use with children on the autism spectrum. Using an iPad, users view and then imitate emotional songs performed by actors, while doing their best to preserve facial and vocal expression. The app tracks a user’s intonation and facial animation and compares it to the actor’s performance. The performance is given a score, which provides some additional motivation for personal development. Individual feedback provided by the app is intended to supplement feedback provided in the choir setting, allowing for fine-tuning of expressive capacity.